Although everybody I asked to accompany me to Seattle Shakespeare’s A Doll’s House, yawned when I mentioned Ibsen, the evening did not cause any yawning, but was very suspenseful and not devoid of humor. Often classic plays are staged with an overly reverent attitude towards the text, so that the performances end up being as dull as a long church service and the characters seem deified. Not so this production, in part because of the directing, but most of all because of the new translation by Sean Patrick Taylor. Originally written in Danish, A Doll’s House criticizes the rigid roles of marital relations at that time, the shaky foundations of marriages based on lies and deception, as well as the legal, emotional and financial realities of women through an intricate plot involving two couples. The attractive heroine, Nora is married to the quintessential Victorian prig, Torvald Helmer. In pre-women’s liberation fashion, she uses her exaggerated feminity to seductively manipulate him…until she realizes that the sacrifices she has made for him will not be reciprocated. In contract, the other couple, the widow Kristine Linde, played by Betsy Schwarz, and her former fiancé, Nils Krogstad, played by Peter Dylan O’Connor, are straight forward and honest. Mrs. Linde takes responsibility for her less than honorable decision to have jilted the man she loved, in order to provide for her family, and does not even attempt to hide behind illusions. Mrs. Linde is the new woman, dressed in an austere manner, in contrast to Nora, dressed in very feminine clothes with high maintenance long blonde hair, who appears and behaves like a woman straight out of any Victorian male fantasy. In the end, Nora adopts Mrs. Linde’s style of dressing and behavior and takes charge of her own life. Rather than use late a late 19th century standard British translations, Mr. Taylor chose to render it into more colloquial American English, and cleaned up many of the Briticisms that would strike a too formal note with American audiences. In addition, he also clarified a certain amount of confusion by paying attention to cultural differences. Both the translator and the director revealed Nora’s risk-taking character both by having her use more current slang and also by the physicality. Other productions I have seen, have not had this quality, so that the risk-taking ending of the play and the original risk she took, which got her into the dilemma in the first place, are not properly foreshadowed and we just don’t quite believe it. In this production we do believe it. This production made me realize how near perfect this play is, thematically and structurally, and unlike many plays, the exposition is done through action, rather than lengthy verbiage. As soon as Nora walks in the door, we know that something is up. The dramatic structure is so tight, so believable and so suspenseful, that I sat in awe during the performance. Without violating the text, the director, Russ Banham, injected a lot of comic relief, which was quite necessary, into this serious play. Nora’s relationship to macaroons was hilarious. Although, it hardly mattered in a production so well-directed, the acting was a bit uneven. Strong performances were delivered by Jennifer Sue Johnson as Nora and Peter Dylan O’Connor as Nils Krogstad, but Michael Patten as Helmer was not very engaging. He played the role, but did not inhabit the character. At the core of every control-freak is someone quaking with internal fear. Although he is fearful of the externals, the audience did not get to see anything of the insecurity driving him to control Nora. Unlike O’Connor, whose vocal ability was outstanding, Patten did not have a very expressive voice and at times lisped. However, the production was so solid, it barely mattered. Technically, the costumes, especially the contrast between Christine’s and Nora’s, sent the right message to the audience. 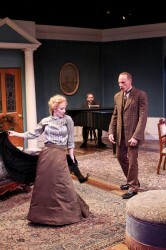 The set was charming and the actors seemed to move around it very naturally, it was attractive enough but expressed the “austere middle-class respectability. With all due respect to the movie versions Jane Fonda and Claire Bloom did in the 70’s, this is certainly the best Doll’s House I have ever seen, and I commend the director for choosing a realistic translation for an American audience rather than just imitate Masterpiece Theatre.